the cost of plastic, and an hourly labor charge. (8.7" x 8.7" x 8"), while the Extended has a build space of 223 mm x 223 mm x 305 mm (8.8" x 8.8" x 12'). For information on using the filament printer contact Paul Marxhausen. Solid Works	is Installed in some Engineering College computer labs. OpenSCAD (http://www.openscad.org/ ) – create models using powerful text description language, free on all operating systems. Blender (https://www.blender.org/ ) - popular 3-D modeling and animation platform, free on all systems. TinkerCAD (https://www.tinkercad.com/ ) Very easy-to-use, free web-browser-based modeler that uses block primitives for rapid design. The EE Shop has several filament type available. Examples of each can be viewed in the display case outside our Shop in room SEC 122. PLA - good general purpose model material. Silver, Black, White, Red, Yellow. ABS -strong, good for precise mechanical parts. White, Black. HIPS -sandable/paintable for models, not as strong. Blue. T-Glass - translucent, very hard, smooth surfaces, slower to print. Green, Clear. Nylon - very durable, prone to warping when printing. Red. Flexible - makes bendable objects. Blue. Different plastics work differently with various glues. 3D printed objects often have a rough surface that is not ideal when using cyanoacrylate glue (“Super Glue”). Epoxy glue sticks well to plastic, can fill gaps, and permits some working time before setting. The Shop sells some 2-part epoxy in single-use packets, and it is available at all hardware stores. While the printer can in theory make 100% solid plastic parts, doing so is costly and takes an extremely long time. Most models instead are printed as hollow shells with honeycombed inner support. Judging from the size, shape and purpose of a model, Shop technicians have a good idea how thick to print model walls and how dense to fill them when running the slicing software. Keep in mind that the printer puts down one layer of material at a time, bottom to top. Objects that have overhanging structure more than 45 degrees from vertical may present a challenge. The Cura software can add temporary support structures to the print job, but the underside surface finish of a part built over a support structure, or that is overhanging without support will not be as smooth as other parts of the print. In some cases using NetFabb to cut the model into parts can solve the problem of difficult-to-print designs. 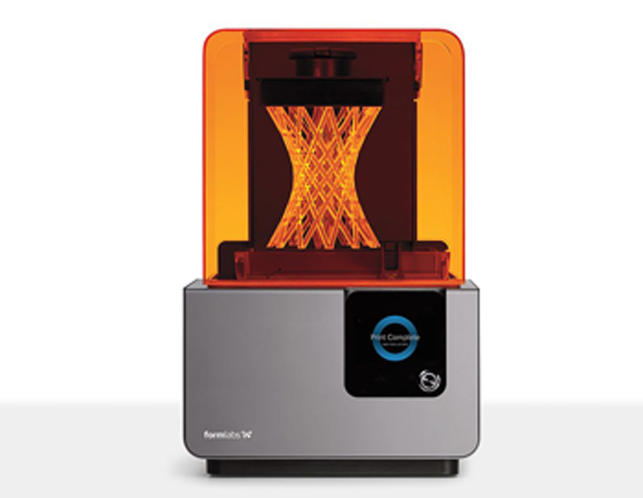 We also have a Form 2 liquid resin high-resolution printer. It has very detailed models with a stuning surface finish. There is 16 types of resin materials. We mostly use clear resin. The cost is more expensive then the Ultimaker filament print. About 5x more and their is a $5.00 surcharge. It works out to be about $.25 ml. when using clear. Other materials the cost will vary. The laser used is a class 1 laser, 405nm violet laser, 250mw. The build volume is 145 x 145 x 175 mm, 5.7 x .5.7 x 6.9 in. Layer thickness 25, 50, 100 microns. The laser spot size is 140 microns. For information on using the printer contact Tom Grady. 3-D printing is can be very slow. Even small objects can take several hours to print. Really large objects can take days, and are more prone to fail as a result. Print jobs are scheduled first-come, first-served, and undergraduate class projects take priority over other research or decorative jobs. 1) Print standard objects that are readily available off-the-shelf. For eample if your project can easily fit in a standard plastic project box, buy the box, even if it costs a bit more. But if your device needs a case with an unusual shape or openings, draw it and we’ll print it. 2) Print large quantities of objects. 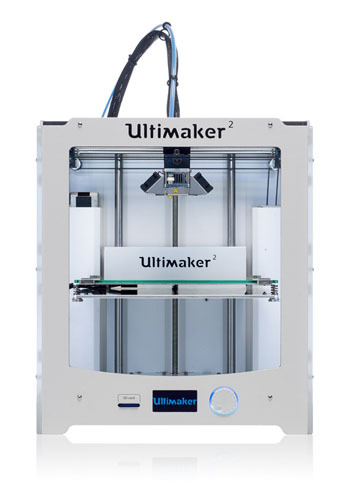 The Ultimaker is not ideal for mass production, rather for single items or small quantities. 3) Reproduce a trademarked or patented design. The Shop may decline print jobs at their discretion, for these and other reasons. You are responsible for the material cost of your print even if the quality of the resulting object is not what you expected. No warranty is made about the suitability of a print for your project. You will not be charged for failed prints resulting from printer malfunctions, however. Print jobs can be emailed to Paul or Tom in the Shop.